With so many good tyres around these days, for each trip I try to use something different. 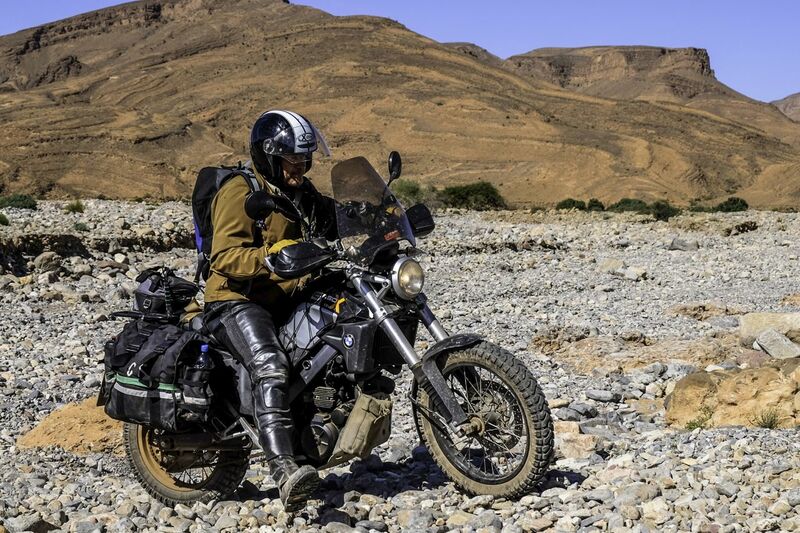 For me that’s usually a trail tyre for the getting there and being there (Morocco in November). So far, in terms of all-surface grip and longevity, it’s hard to beat the Heidenau K60s I used a couple of years ago. Someone told me recently that Heidenau is the modern iteration of the notorious Pneumant East German brand from the 1970 and 80s. Many a prematurely grey MZ rider will know what I’m talking about. This time round I’m trying the similar, Czech-made Mitas E-07. Front and rear delivered to the middle of nowhere for under £100 a pair. That will do nicely. 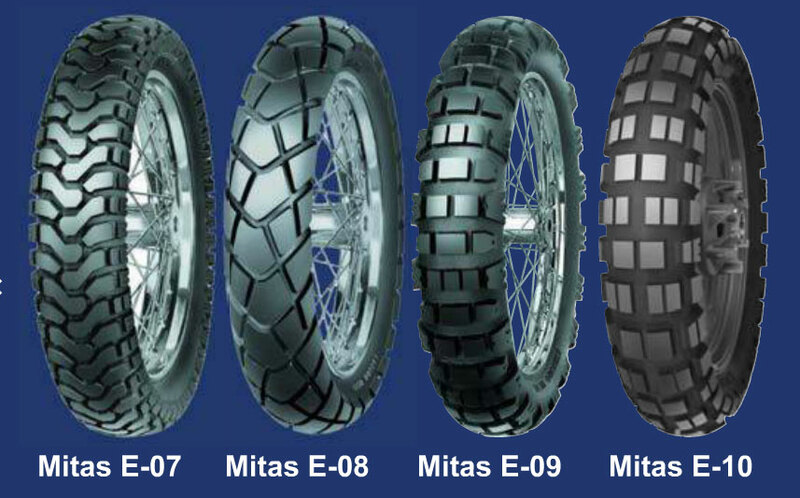 In the Mitas range you could say it’s the trail bike tyre out of the four pictured above left. 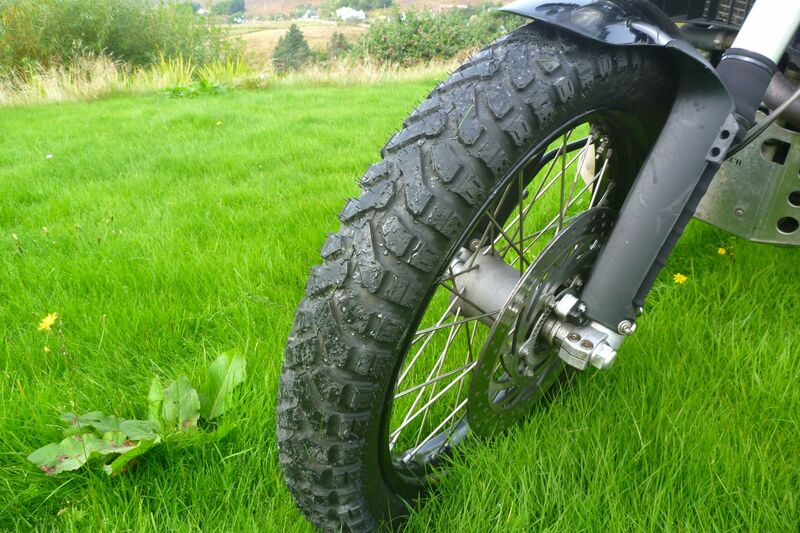 I did consider the 09, but it’s a long winter’s ride to Morocco and once there, on dry rock pretty much any tyre will do. Knobs only help on the occasional loose surface like sand. I’d like to try an 09 one time to compare with the much admired but fast wearing TKC80. Getting the old Tourances off proved the usual struggle. 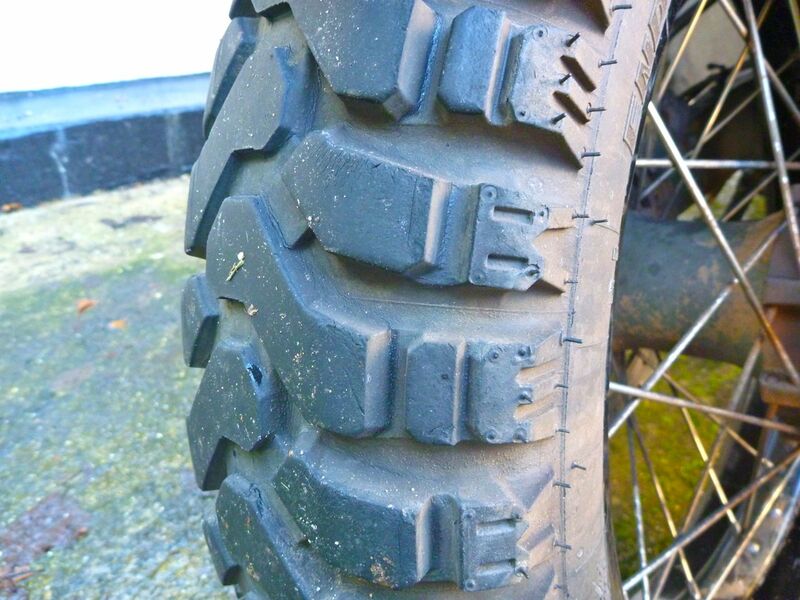 The Mrs had to drive repeatedly over the tyre to break the bead that it had me convinced there was some annoying, tubeless-style safety lip in there. Far from it, so you do wonder how you’d manage alone out in the desert. It’s why I prefer tubeless with Slime. The less need for lever swinging the better. But when there’s no choice I’ve found tyre mounting is greatly eased with a pair of 350-mm Italian Buzzetti Pro tyre levers. I’ve had my pair for years, as well as a little BMW number which is so old it says ‘Made in W. Germany’. Quality steel means both can be as narrow and thin as possible to help tuck under the bead without bending. In the UK this place in Buxton sells then for about £11 each. 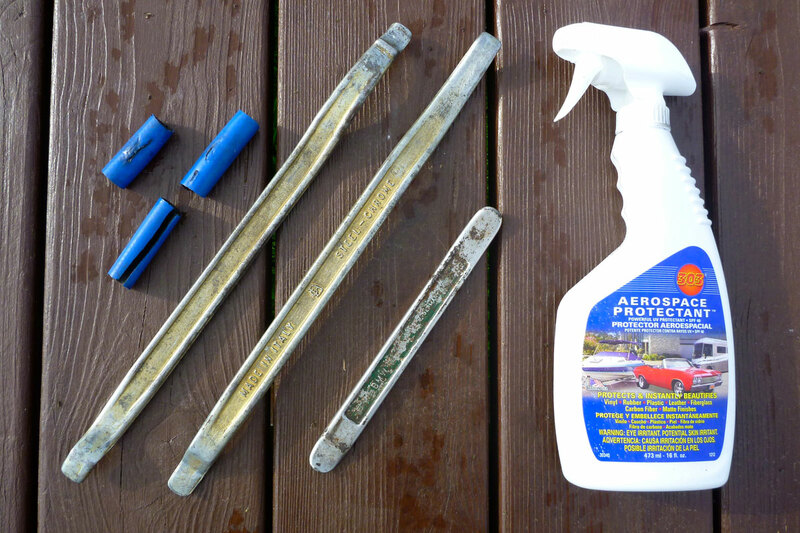 The other thing I discovered recently is using Aerospace 303 as lube. It’s actually a UV vinyl/rubber protectorant I use on my kayaks, but lubes up nicely. Anything will do of course, but once dried 303 gives a teflon-like slipperiness, rather than an oily or soapy film. Next time I’ll pre-spray the beads and the rim and let them dry – less wasteful that way. The blue things in the picture are home-made rim savers (bits of thick split garden hose), though they work best when removing a tyre. Going the other way, there’s a risk of them being pulled into the tyre. That will not do nicely. Despite all this superb equipment, a task that requires some application can produce a hasty ‘right, let me at ’em’ attitude – or perhaps that’s just me. So much so that I fitted the front against the recommended rotational arrow. It’s not that critical unless I start pulling stopies for a living, though the tread pattern may wear better (i.e. : cup less) in the correct direction. And on the back I failed to give the tube a few psi to give it some shape so as to clear the levers – with predictable results. Oh well, all good practice which I clearly need. AdvSpec were doing Conti tubes for under £11 a shot. It does remind me that familiarising yourself with the whole wheel-removal/tyre changing/wheel refitting business back home can save a lot of stress on the road. When you’ve done it once in the back garden (however much of a mess you made of it), you know you can do it again and are familiar with any required knacks or order-specific procedures unique to your bike. Even with the 303 all over the front, it took a lot of pressurising/deflating/lubing/a run round the block and more repressurising up to 75psi to get it to sit fully. With that done it was time to do the 50-mile round trip to the shops as the larder was looking as bare as my old Metzelers. Most of that run is a bendy single track road between mountain and loch (left) with plenty of hard breaking into pull-outs to dodge oncoming traffic. With the new E07s the XCountry was transformed, reminding me how it ran when I picked it up less than nine months and a surprising 4000 miles ago. Where have I been? Since that time the bike has acquired a lardiness which I put down to the 10-15kg of extras I’ve fitted. Including a steel subframe it adds up to 10% extra weight. The front end especially felt heavy, even after a Hyperpro make-over. Seems it was only the worn down Tourance after all. 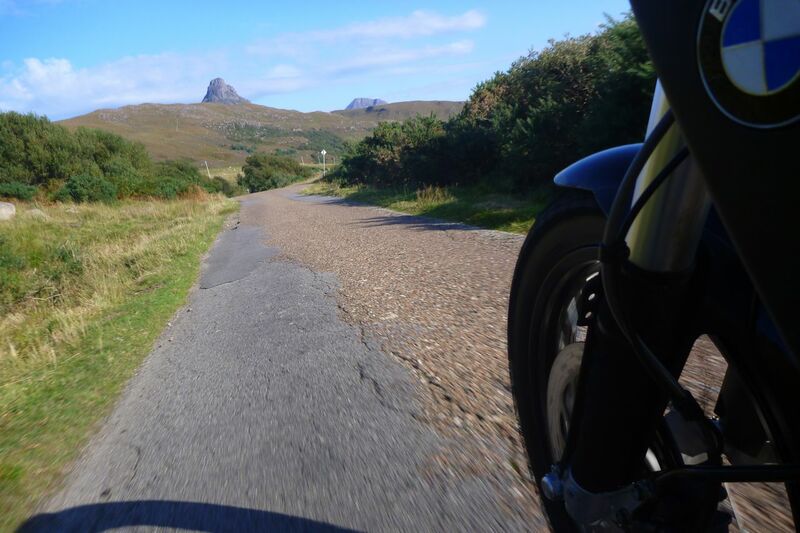 Now that both tyres have round profiles, the 650 swung along that narrow road as if on rails. Cornering confidence was much improved and there was none of the new-tyre edginess that the ‘Catspaw’ K60 initially demonstrated on the BMW twin. Far from it; it just encourages you to push on towards the new limits. I did feel a bit of headshake at 70, but that could have been the strong crosswinds, the surface, the screen or just the fresh tread. 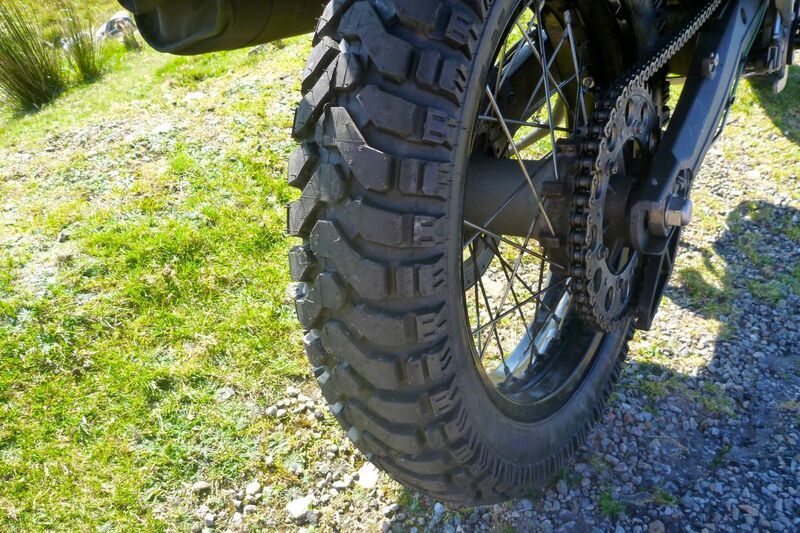 I imagine the chevron-bar ‘tractor’ pattern will work well enough on gravel, letting the tyres roll off small stones which will fall between the tread’s bars. In mud I’m not expecting miracles unless I drop pressures substantially. 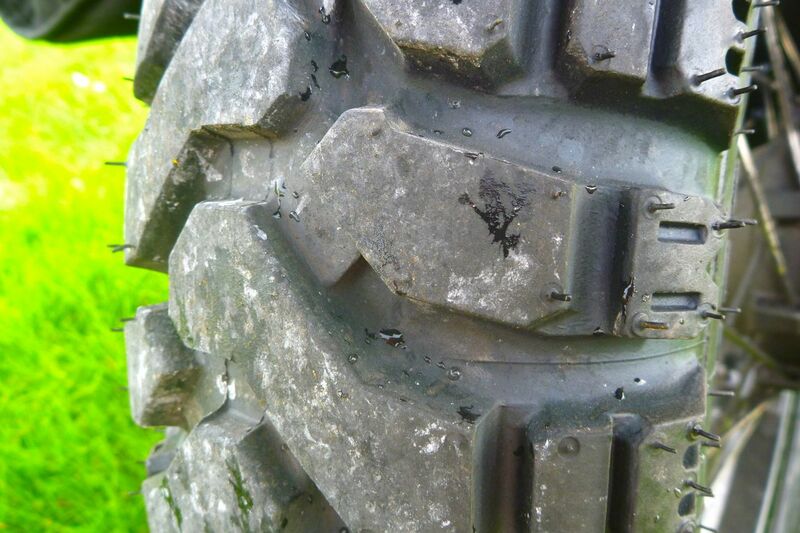 The depth of the centre tread – about 6mm front and back – seems less than the K60s. 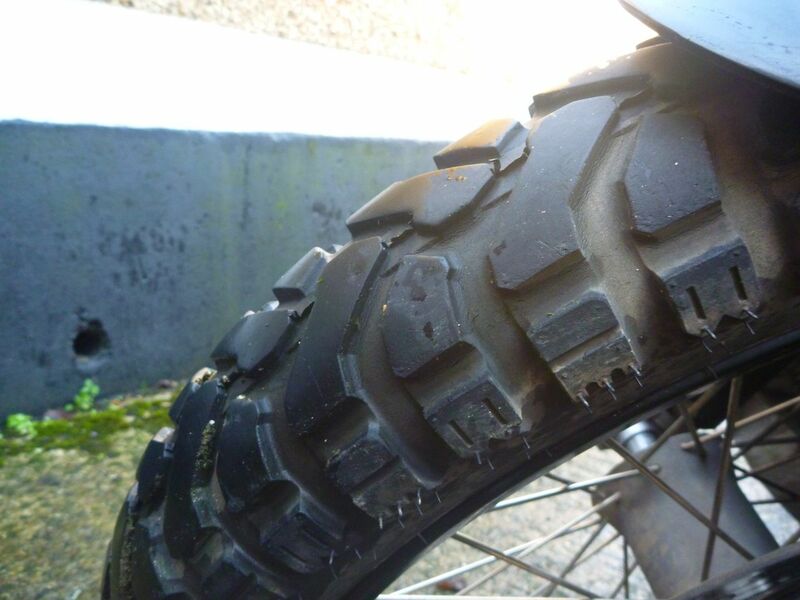 We’ll see how it performs on the road to Morocco where, as long as it was dry and you rode accordingly, last year’s Husky TR650 managed pretty well on the Dunlop Trailmax tyres. I expect the Mitas to be a bit more sure-footed on the pistes. Back from Morocco, Xco sold and as expected, I’m a convert to the Mitas E-07s. Sure-footed on the road, rain or dry, and for the way I ride, fine enough on the piste at road pressure. No weird edginess when running in, rarely made any road noise that I could hear and about half worn at 5000 miles (pix left and right) after a lot of fast road and a few rough stony tracks. 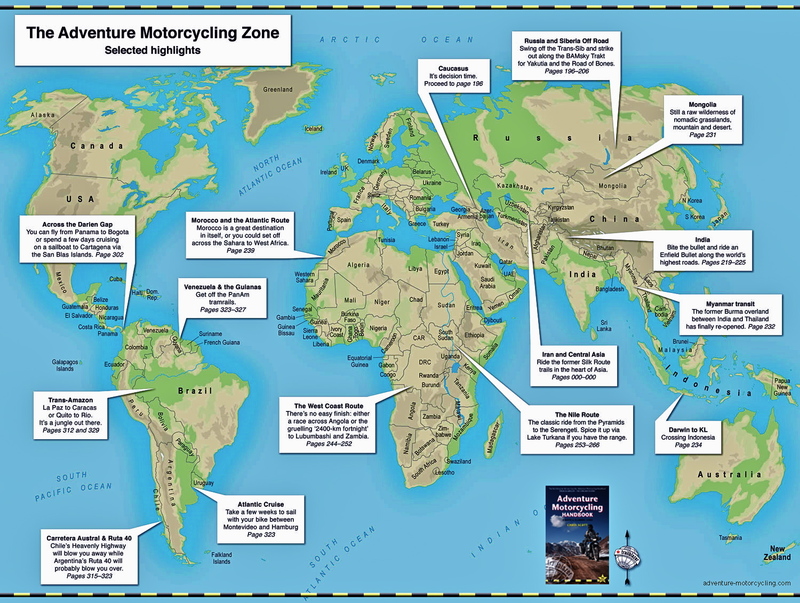 This entry was posted in Adventure Motorcycling Gear Reviews, AMH News, Project Bikes, Project: BMW Xcountry and tagged Aerospace 303 UV protectorant, BMW X-country, buzzetti pro tyre levers, Mitas E-07 tyres, Mitas E07 tyres. Bookmark the permalink.